As you can see from the photo of the Center City District - Walk! Philadelphia map, the Philadelphia Historic District is shaded in red, on the map. It also encompasses three separate areas - Old City Philadelphia, Society Hill, and Penn's Landing. Note that the maps are not always oriented, with NORTH at the top. For example, in the photo above, WEST is at the top, because that's the way the pedestrian is facing, on that particular sign at 17th and Market Streets. Accordingly, the Philadelphia Historic District, which is EAST, is located at the bottom of that particular map. While there are numerous commercial lots, the Philadelphia Historic District is really best explored by the Phlash trolley, SEPTA, on foot, and by taxicab. There is also street parking with meters and parking kiosks, which you have a better chance of finding at night and on the weekends, especially. In fact, your best bet is north of Market Street, as most of the main attractions are south of Market. The purple Phlash Trolley offers many stops in the area, during its six months of operation between May 1 and October 31. It doesn't run at night, either, but it's far and away your best option, if you happen to be in Philadelphia while it's running. Click on the Phlash Trolley link above to learn all about the Phlash, and how to use it. SEPTA Regional Rail train service offers you a great way to reach the Philadelphia Historic District. Just take the train inbound, from nearly any outlying train station anywhere in Greater Philadelphia, to Market East Station - located at the intersection of 11th and Market Streets. Although Market East Station is located in the teal-colored Pennsylvania Convention Center District, it offers easy connections to the SEPTA Blue Line, the Phlash Trolley, and SEPTA bus routes going to the Historic District. You can also simply walk the several blocks, over to the tourist attractions clustered around 5th Street, over to Penn's Landing. In fact, we've created a unique Market East Station to Old City Attractions Guide - which hopefully should provide you, with all of the logistical information and directions you need, to travel from Market East to the Historic District and back. The SEPTA Blue Line provides direct service into the heart of the Historic District. 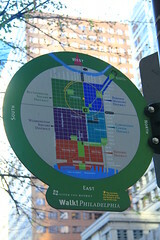 In the teal Pennsylvania Convention Center District, it has stops at 13th Street, 11th Street (a connection to Market East Station), and 8th Street; in the red Historic District, it has stops at 5th Street and 2nd Street. Note: Anywhere on the SEPTA Blue Line, if the station name contains the word "Street", it will be located at the intersection of that particular street, with Market Street, the main east-west artery in Center City Philadelphia. For example, in the red area of the map, "5th Street Station" is located at 5th and Market Streets; "2nd Street Station" is located at 2nd and Market Streets; etc. For starters, we recommend our Philadelphia In Only One Day Page - which is a detailed, one-day self-guided tour of the Philadelphia Historic District. We also recommend our Old City Philadelphia Main Page as a good place to start, in order to learn the area. We'd recommend our Penn's Landing Main Page - to learn more about the waterfront entertainment district, on the Delaware River. Among other attractions, there is the Independence Seaport Museum and the RiverLink Ferry, which takes you over to the Camden, New Jersey riverfront, and the many attractions on that side of the river. Our comprehensive Society Hill Main Page has a detailed guide to the many 18th-century, Georgian homes which occupy this picturesque neighborhood with cobblestone streets, some of which are open for tours. At the bottom of the Philadelphia Historic District is South Street. Take a look at our South Street Main Page for more on how to explore this bohemian street, at the bottom of Center City Philadelphia. South Street runs all the way as the de facto southern border of Center City. In addition to being the southern border of the Philadelphia Historic District, it is also the southern border of the purple Washington Square District and green Rittenhouse Square District. However, when Philadelphians say "you should visit South Street", cool South Street is generally defined, as the section closest to the Delaware River - which is to say, the part of South Street, within the red Philadelphia Historic District. This is concentrated around historic Headhouse Square at 2nd and South Streets, and extending several blocks west, on the east side of City Hall. If you'd like to leave the Philadelphia Historic District, and return to the Center City District Main Page, please click here.